We’ve had a group of azaleas in our backyard since we purchased our house more than a decade ago. Each year I think, “Maybe this year they’ll bloom.” They grow taller and bushier as the years pass, but seldom do they exhibit more than a few flowers. This spring, however, we finally had a full bloom, with all four azaleas just brimming with color. It was a lovely sight, the deep crimson of the flowers set against the deep green of the new fiber cement siding on our house. Perhaps that’s what they were waiting for—a more appropriate backdrop than the dingy gray vinyl siding we pulled off last fall. Smart flower! Lovely color and focus! I have azaleas in several colors. 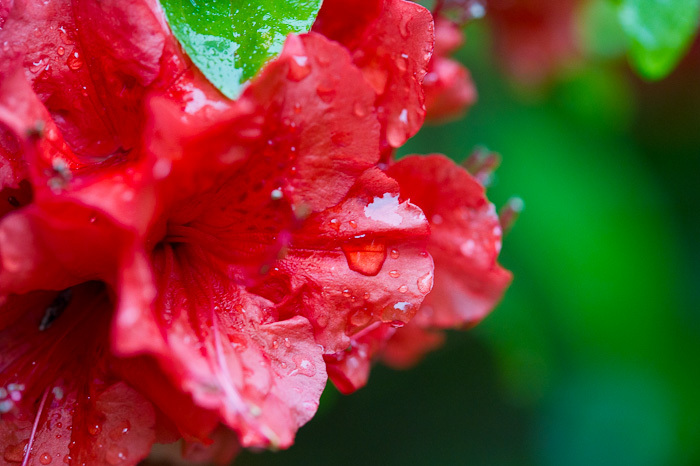 I I especially enjoy the Encore Azaleas since they bloom in spring and fall.